Another view from the Buckeye Trail. A friend of Coppertone's gave the trails here high marks so we decided to see for ourselves. After passing by the picnic area near the trailhead the trail gets bracketed by chain link fences, which feel a bit odd, almost like cattle being corraled. Once the trail passes the state hospital property the trail splits into several directions and the feeling of claustrophobia ends. The recent rains have made a good percentage of the trail kind of muddy a the moment. In a few select spots we had to route around standing puddles of water in the middle of the trail. For the second time in as many weeks we also encountered a little bit of ice on shadier patches of trail as well, despite the temperatures reaching into the 50's by the time we passed by. There were almost as many cyclists as there were hikers, but we had nothing but exchanges with each of them on the trail. The only negative were one or two passes where the narrow singletrack on steep slopes made squeezing to one side to let each other pass a little tricky. We did a loop consisting of the Buckeye, Skyline, Chaparral, Marie Creek Trails and Lake Marie Road. We'll save reaching the top of Sugarloaf Mountain for another visit when we'll plan a bit better and choose a quicker path to the back of the park. This is one of the better new trails that we've visited lately and we'll definitely be back to complete more of the trails. Ken has been hard at work revising, updating and expanding his essential guide to Napa County and vicinity hiking. The new edition of the book is now available. You will certainly want to have this greatly expanded and updated edition. Ken has added 56 pages of new text, with abundant new history and new hikes. New hikes include: The big new Lynch Canyon/Newell Open Space,the Aetna Springs (east) end of the Oat Hill Mine Trail (recently opened to the public), greatly expanded coverage of Cedar Roughs, new sections of the Napa River Trail including the River to Ridge Trail, the Napa/Solano Ridge Trail, great hikes in the new 9,000-acre Knoxville Wildlife Area, Mt. 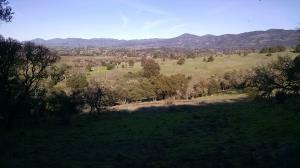 Hood Regional Park (including the new Johnson Addition off Pythian Road), plus new hikes at Stebbins Cold Canyon Reserve, Sugarloaf Ridge State Park (McCormick Ranch Addition), and Blue Ridge. Ken has combined all these new hikes with updated reports on Napa's classic hikes to bring you a greatly expanded trail guide, with a new emphasis on where you can hike with your dog.